This will be quick, much like my time with Sunday Riley’s Auto Correct Brightening and Depuffing Eye Contour Cream. One week after starting this product, I’m throwing in the towel. Auto Correct is nearly unbearable for me to use, and my experience has made me so churlish that I need to share my reasons why. This product was provided by Sunday Riley. This post contains affiliate links, which enable me to receive a small commission on sales made by clicking the links. Affiliate links are marked with an asterisk(*). Picture the background as black crepe, because this is a funeral. 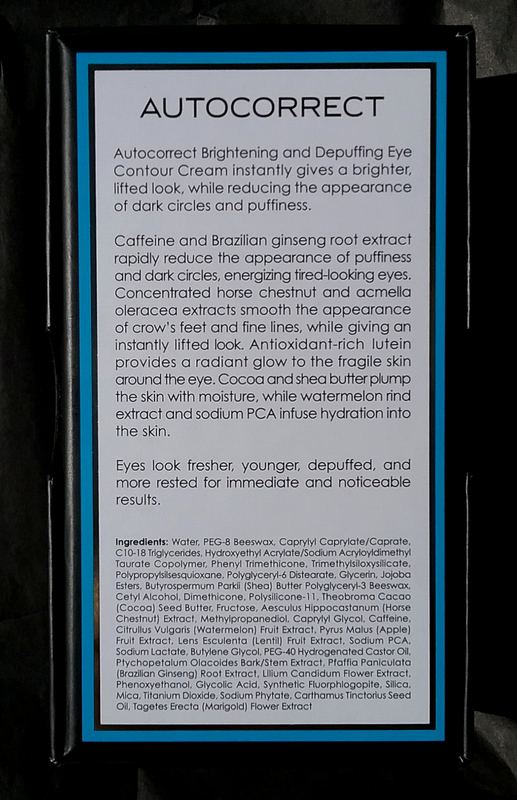 Based on marketing copy alone, Auto Correct sounded like exactly what I’m looking for in an eye care product. It claims to lift, depuff, brighten, plump, and moisturize the skin in the eye area, and it contains several ingredients I either like or find intriguing. I personally requested a bottle of the product from the brand and was so excited when it arrived that I made room for it in my routine right away. Too bad marketing copy alone never tells the full story of a product. Does Auto Correct lift and depuff? Yes. The one positive thing I can say about this product is that it rapidly delivered noticeable tightening and depuffing effects for my eyes. I can usually tell when a product has reduced my eye puffiness because I’ll start to get double eyelids, which never happens when my eyelids are retaining even a little water, which is pretty much all the time, since I love salty food. The double eyelids emerged by the second or third day of testing. Beyond the lifting and depuffing effects is where things start to go awry. Auto Correct does brighten, I’ll give it that. Thing is, it brightens instantly because it’s lightly tinted and contains copious amounts of finely milled shimmer. The shimmer is mother-of-pearl-ish, the tint about the same level of opacity as Glossier skin tint or other similar light coverage skin makeup product. I can’t count these effects as skincare effects, since they’re delivered using makeup formulation tricks. Shimmer isn’t the best thing for fine lines, anyway. Rather than plumping up or filling in the little lines around the outer corners of my eyes, Auto Correct made them more noticeable. I’m not sure that’s a fair trade-off for a slightly brighter eye area. Shining a spotlight on something you’d rather not have visible seems counterproductive. Also counterproductive, at least in my opinion, is an eye cream that hardly seems to hydrate or moisturize at all. While my eye area isn’t the driest, it does need some moisture to keep it looking as firm and smooth as possible. Over the course of the past week, I found my eye area feeling dryer and dryer and, worse, more and more sensitive. When the skin around my eyes started getting itchy and irritated a couple of days in, I thought it might be allergies rather than my new eye product, so I kept on using Auto Correct. After a few more days, the itching and sensitivity had gotten so intense that I was dabbing COSRX snail essence around my eyes multiple times a day to soothe them and add moisture. After I dropped Auto Correct from my routine, the itching and burning stopped at once. Trying not to rub my eyes was maddening. Finally, as if the drying and sensitizing effects of Auto Correct weren’t bad enough, this product stinks. Literally. You know that smell you get if you leave a damp towel lying around for a couple of days? Auto Correct smells like that. It smells like days-old damp towels. On your eyes. It makes your eyes smell like days-old damp towels, for hours. It reminds me of that Dane Cook bit where he goes straight from a weird date to his friend’s house to make his friend smell his eyes as a way of explaining how weird the date was. I bet you never thought you’d find a Dane Cook reference on this blog. I’m sorry. I’ve been walking around trying not to rub my dry, itchy, smelly eyes all day for an entire week, and I am done. Auto Correct’s presumably tiny amounts of interesting botanical extracts may have some long-term anti-aging benefits (doubtful), but I won’t be sticking with the product long enough to experience those. Conclusion and alternative recommendations: A truly remarkable eye care product is hard to find, at least in my experience. Most perform about the same as a regular face cream would, though perhaps with heavier moisture or lighter fragrance, to cater to the generally dryer and more sensitive eye area. 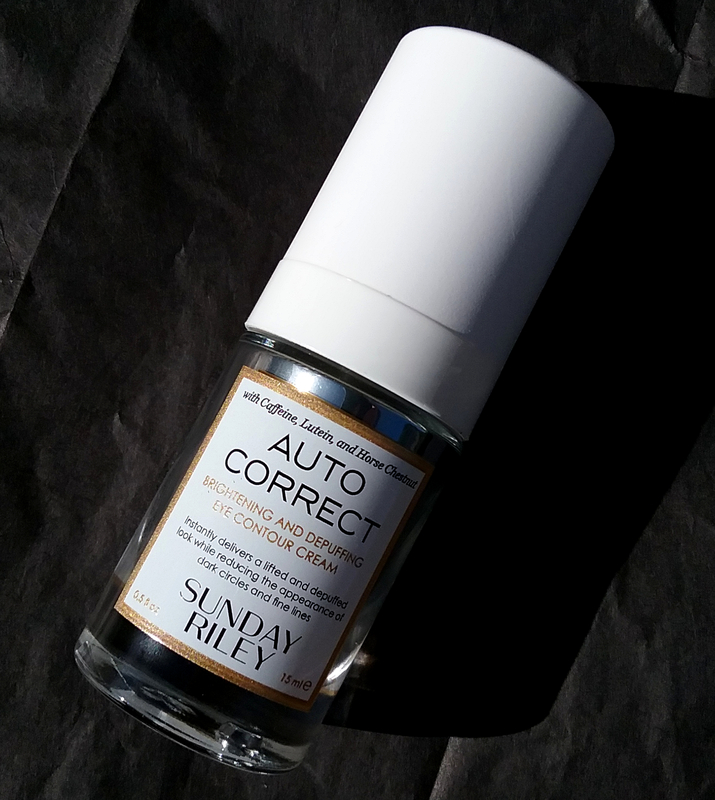 Sunday Riley Auto Correct actually performed worse for me than any random face cream in my stash would have, in all areas except for the lifting and depuffing. Personally, I’m going back to my long-term testing of Sulwhasoo Timetreasure Renovating Eye Serum*. I had been noticing some very gradual renovations in general eye crepiness with this product, without any bothersome side effects. At this point, that seems far preferable to my week of suffering with Auto Correct. If you’re looking for lifting and depuffing, but without the shimmer, smell, or potential drying and sensitizing effects of Auto Correct, I highly recommend considering Amorepacific Intensive Vitalizing Eye Essence*. I reviewed it here and consider it HG for depuffing. If you want to invest in a rich but non-greasy and dramatically line-smoothing eye cream, I haven’t tried anything better than Sulwhasoo Concentrated Ginseng Renewing Eye Cream*, which filled in fine lines spectacularly for me and gave me the perfect amount of moisture. On the other hand, if you just want a simple hydrating eye cream that won’t make your wallet cry, Mizon Snail Repair Eye Cream* works just fine and is dead cheap. The slightly fancier Whamisa by Glow Recipe Chai Tea Eye Cream, which Glow Recipe sent me a while back, also does the job well and gives a little more richness than the Mizon snail eye cream. And none of the alternative options I’ve just listed will make your eyes smell bad, so there’s that. Great review. Thanks for enduring that for a week to give us an honest assessment. Thank you for the honest review! That surely saved some people good money. I laughed so much when I saw the smell my eyes video! So grateful you warned us about an dissapointing product! Thanks for sharing! Everyone raves about this eye cream. I agree 100% with you – it’s not moisturizing at all, there are too many ingredients that are irritating and it smells like old musty towels. I noticed I have these red dots – like tiny little blood spots – something I’ve never ever seen. It’s a no for me. My friends all love it for de-puffing qualities.